A camera lens used for taking close-up photographs has a focal length of 22.0 mm. The farthest it can be placed from the film is 33.0 mm. (a) What is the closest object that can be photographed? (b) What is the magnification of this closest object? This is College Physics Answers with Shaun Dychko. This Camera’s focal length is 22 millimeters and the image distance is 33 millimeters because that's where the film is going to be placed. And so the question is what is the object distance? 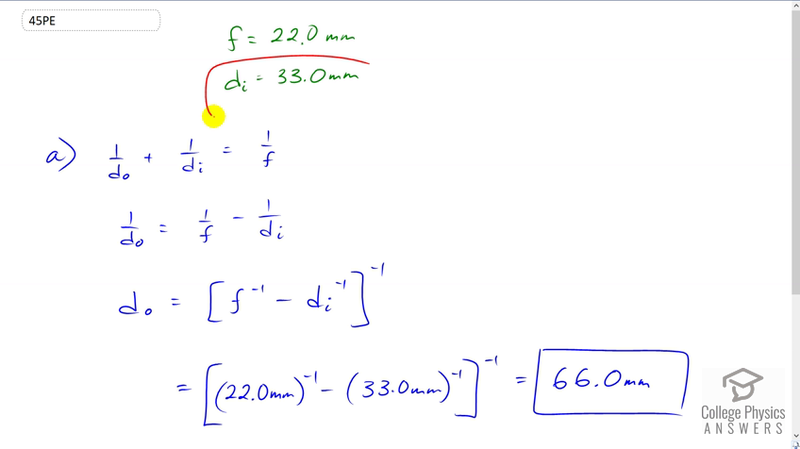 And so we have the thin lens equation which is reciprocal of object distance plus reciprocal of image distance equals the reciprocal the focal length. And we'll solve this for do by first subtracting one over di from both sides. And then we have one over do equals this and then we raise both sides to the exponent negative one and we get that the object distance is the reciprocal of the difference in the reciprocals. So it's focal length to the power negative one minus image distance to the power negative one. I'd like to write these as exponents with negative one instead of as fractions one over. But you know it was just a personal preference. So the object distance is going to be 22 millimeters to the negative one minus 33 millimeters to the negative one all to the negative one giving an object distance of 66.0 millimeters. Magnification is the negative of the image distance divided by the object distance. So that's the negative of 33 millimeters divided by 66 millimeters which is negative 0.50 and it's negative sign just means that the image will be inverted compared to the object.